John Cherry, a graduate student at UC San Diego, models stellar explosions, including a type called a core-collapse supernova. As these stars run out of fuel, their cores suddenly collapse to form a neutron star, which quickly rebounds sending seas of neutrinos through the surrounding stellar envelope and out into space. Even as the collapsed core is rebounding, the rest of the star is still falling inward. Plumes of matter sink, accreting onto the core. “This matter is actually causing some small fraction of neutrinos to bounce at wide angles and cross the trajectories of neutrinos coming from the core,” Cherry said. Astrophysicists knew that the heart of that envelope contained these scattered neutrinos, but because they are relatively few compared with the numbers streaming from the core, the scientists thought halo neutrinos’ influence on the physics of these explosions would be so minor it could be ignored. Not so, Cherry and colleagues demonstrated in a paper they published in Physics Review Letters. They showed that neutrinos streaming from the core interacted with halo neutrinos far more often than anticipated. Cherry calculated how often that might occur and how large a difference it would make to their models of neutrinos within supernovae. “What was so startling about this is that nowhere was the correction less than 14 percent. That’s enough that you need to worry about it,” he said. Indeed, the some places in the outer regions of the envelope require as much as a 10 fold correction. Neutrinos are famously aloof particles that seldom interact with other matter. “The way neutrinos interact in matter depends on what we call ‘flavor’,” said George Fuller, professor of physics at UC San Diego who leads the neutrino-modeling research group and is a co-author of the paper. When neutrinos meet, they “scatter” off one another and in the process can change their flavor. The influence is much greater than physicists thought in the outer halo of neutrinos. “Even though few neutrinos are scattered in funny directions, they can completely dominate how the neutrinos change their flavors,” Fuller said. 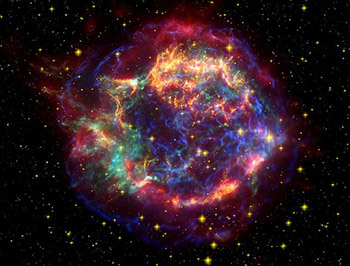 These stars also forge new elements, and neutrino flavor influences this process as well. Joe Carlson and Alexander Friedland of the Los Alamos National Laboratory are co-authors of the work, as is Alexsey Vlasenko of UC San Diego. All authors are also affiliated with the New Mexico Consortium’s Neutrino Engineering Institute in Los Alamos. The National Science Foundation funded the work at UC San Diego. Work at LANL was supported by the Department of Energy, LANL’s internal funding program, and Open Supercomputing.